All parents want to set their children up for a future of financial security, so it’s important for a parent to teach their children how to save money. With the latest studies showing that by the age of 7 our money habits are ingrained in us, it’s never been more essential to discuss money matters with your kids in an age-appropriate way. Children as young as 3 can get their heads around the concepts of saving and spending, and you can help them develop healthy, positive attitudes towards saving. We’ve summed up the 8 top ways to teach your child to save – and they’re all fun and easy to put into action, too. Using a piggy bank is a really easy way for your child to get their head around the idea of saving. 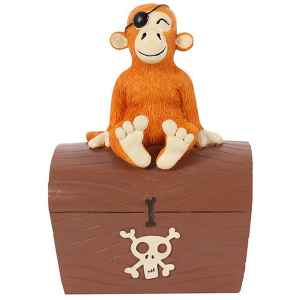 Not only is it visual, allowing children as young as 3 or 4 to understand the concept of saving and to see their money accumulating, there are some really cool piggy banks available now to make it even more fun and appealing. From a piggy bank made completely of Lego with moveable parts to on-trend unicorn piggy banks and piggy banks in the shape of everyone’s favourite snowman, Olaf from Frozen, there’s something to appeal to every age! Without money coming in, your child can’t save, so one of the first steps you need to take is to agree a regular amount of pocket money you’ll give them. It doesn’t need to be a large amount but try to give it in smaller denominations – for example, £5 in pound coins rather than a note. This way it’s easier to choose to spend a little and save a little. Now that your children have some money coming in, set up a system of colourful Savings Jars. 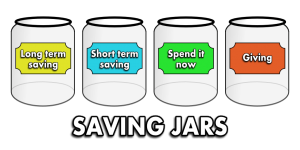 Some people choose to have three jars – one for spending, one for saving and a third for giving to charity. Others designate specific jars for a particular item their child really wants, or for holiday spending money. Talk with your kids and see what they would like to save up for – go for a cheaper item at first so that they don’t get discouraged with a long wait. Make it even more fun by letting your kids decorate the boxes with stickers, paints or colouring pens. Once your child has started to get the hang of saving money and has collected a good few coins in their piggy banks, count it all up together so they can see how much they’ve achieved. Then take them out to open their first savings account – your child will feel really responsible and proud of themselves! Check out this Which article on the best savings accounts for children to find out all your options and decide which account to go for. Studies have shown that children really do learn best from playing, and playing Shop has been a favourite for decades, it never grows old. Get involved in the fun and use real money to familiarise your children with the different coins (and notes if you’re feeling brave). Depending on their age, your children can practice counting coins, adding up the totals or making the correct change. It’s good practice for when the time comes for them to spend some real money. Chores are a great way for children to earn a little extra money and become more responsible and independent around the house too, so it’s win-win all round! Have a chat together about which jobs they would be capable of taking on and agree on how much each chore will pay. Even toddlers and preschoolers can help tidy up their toys, whilst older children could fold laundry or load the dishwasher. This helps them equate earnings with hard work, developing a good work ethic which will serve them well later in life. 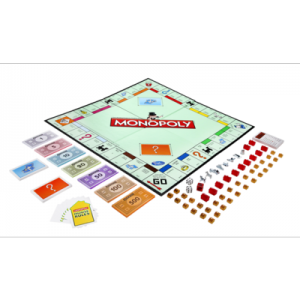 By playing games like Monopoly and The Game of Life together, you can introduce and reinforce key financial concepts like borrowing, saving and budgeting whilst spending time together and having fun as a family. It won’t seem like a lesson, but the information will be absorbed – without your child even realising they are learning! So plan in a Family Games Night and expand your child’s knowledge at the same time. Here are some fantastic board games and card games that teach financial literacy. Let your kids get involved with the weekly shop. You could give them £3 and ask them to pick out some fruit – they’ll get a chance to see how far the money can go and choose between items of different prices. If you need to pop into the local shop and pick up a loaf of bread, let them pay – and make sure they check they get the right change! It’s all good practice which will build up over time, meaning that they’ll be ready to handle money confidently by the time they are going out on their own or with friends. If you draw up some savings incentives, it will give your child extra motivation to save. Maybe they really want a particular Xbox game or new toy – you could offer to match a percentage of the money they save, or for example, add £10 for every £50 they save up themselves. Whatever you feel comfortable with, it gives your child an extra boost and encourages them to save rather than spend. It’s not always easy waiting to reach a savings goal, especially if it’s a larger sum requiring a lot of patience to get there – this way makes it more exciting for them! 10. Celebrate when they hit a savings goal! As well as offering financial rewards for reaching specific savings goals, do something special to celebrate that milestone together. You could go out for pizza, buy in your child’s favourite treats or just have a family movie night – it doesn’t have to be something really expensive, as the idea is to get them to appreciate the value of money. You just want your child to feel good about reaching their financial goal and have a positive attitude towards saving money so that they don’t see saving as a burden. You’re developing healthy money habits in your children from a young age, something that will continue on into adulthood. 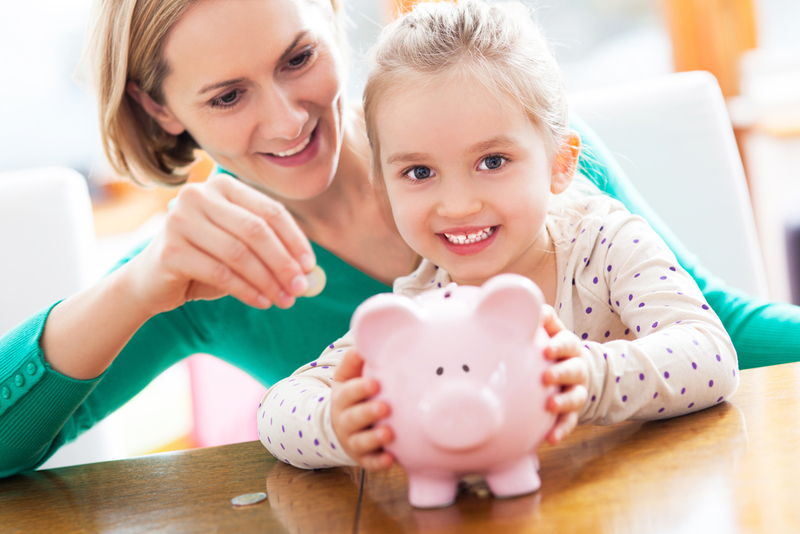 So there you have it, some fun and easy ways to encourage your child to save money. No matter how young your child is, you can help them to develop healthy financial habits by explaining and demonstrating concepts like spending and saving. Following these steps will give your child a chance to understand the real value of money, how to set specific goals and save up for them – and they will feel a real sense of achievement when they hit them! You’ll be setting your child up for a future of financial stability and safety and you’ll have some fun, bonding experiences along the way.